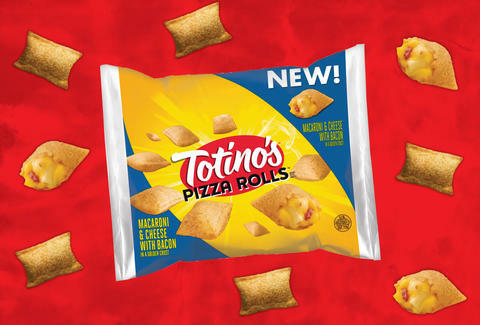 Totino's has built a hot and gooey empire out of beloved frozen pizza rolls, which have been delighting munchies-craving tweens and adults alike for decades. They even played a central role in one of the funnier SNL digital shorts in recent years. But now, the brand is branching out into new, melty snack territory with the debut of its latest roll variety: Macaroni and Cheese with Bacon. Get thee to a freezer aisle near you. According to a company spokesperson, the Macaroni and Cheese with Bacon offering is the brand's first new pizza roll flavor since 2016 when it launched a limited-edition Cheeseburger version. In 2015 they added a Bacon and Pepperoni roll to the lineup and last summer introduced queso-packed "stuffed nachos," though the latter aren't technically part of the roll family. The Mac and Cheese with Bacon rolls started shipping this week, and will be available everywhere by October, so don't freak out if they aren't at your local grocery store right this second. You'll eventually be able to pick them up in 40- or 90-count packages (which, fingers-crossed, don't skimp).